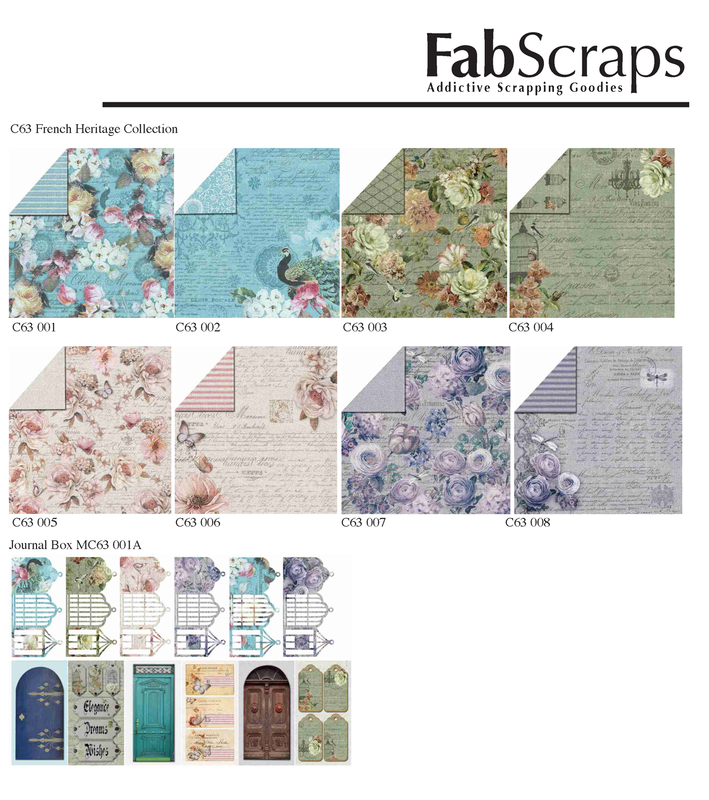 FabScraps newest collection, French Heritage, is dripping with charm, warmth and spectacular florals. I'd also have to say that the accompanying chippies are rather amazing as well. I love peacocks, they are classic elegance as well. 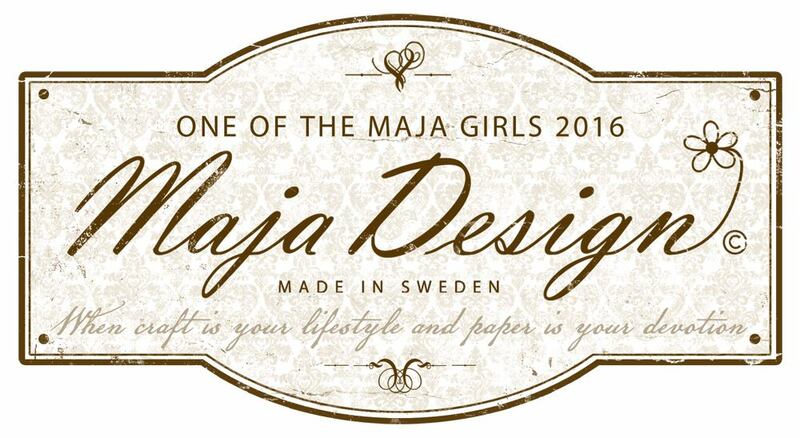 Below is the paper collection samples. I have included some super simple step by step instructions on how to create a similar tag. Just scroll down the page. 2. Cut a cardboard rectangle to the desired size of your tag. 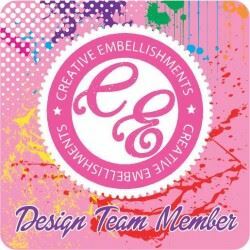 I like to make my tags with a cardboard base if I am adding a lot of embellishments. 3. Rip the edge of the cardboard so that some of the corrugation is showing. 4. Paint the corrugated section or emboss with gold. I did both – painted with gold, then sprinkled gold embossing powder here and there. Heat set. 5. 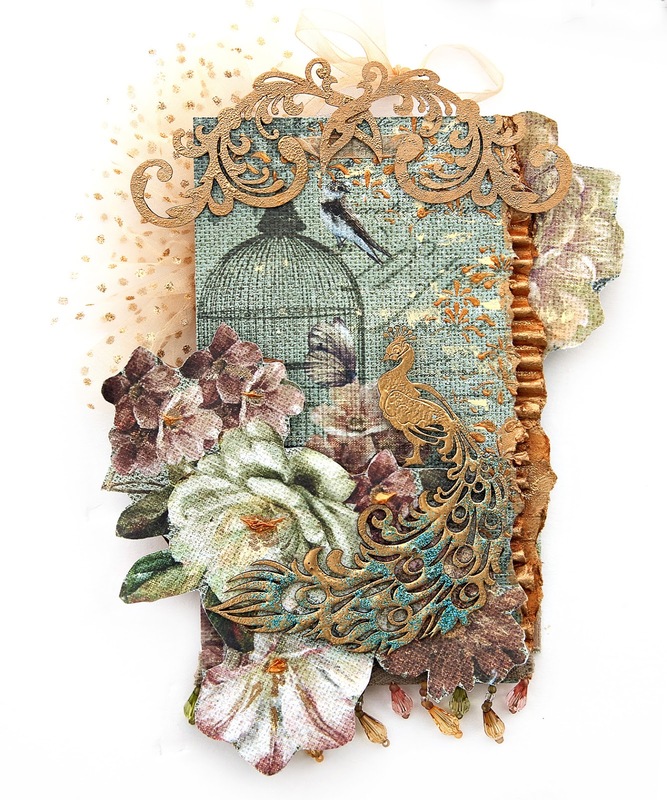 Using FabScraps French Heritage Collection Autumn Floral 2 C63004 cover cardboard - leaving corrugation section showing. Glue down. 6. Stencil on the paper as desired. I used gold embossing powder. 7. Glue strip of bead trim to the bottom of tag. 9. Fussy cut flowers from FabScraps French Heritage –Autumn Floral C63003. Adhere to cardboard to give them dimension and glue to front of tag. 10. Fussy cut another flower and glue to the back of the tag, at the top. 11. Cut a strip of tulle approx 8 inches long. Fold in half so that you now have a 4 inch piece. Fan it out and adhere to the back of the tag. Tricks to adhering tulle or trim to the back of a tag: glue the tulle down, then cut some paper to glue over it. The paper helps hold the tulle in place and secure it. 13. 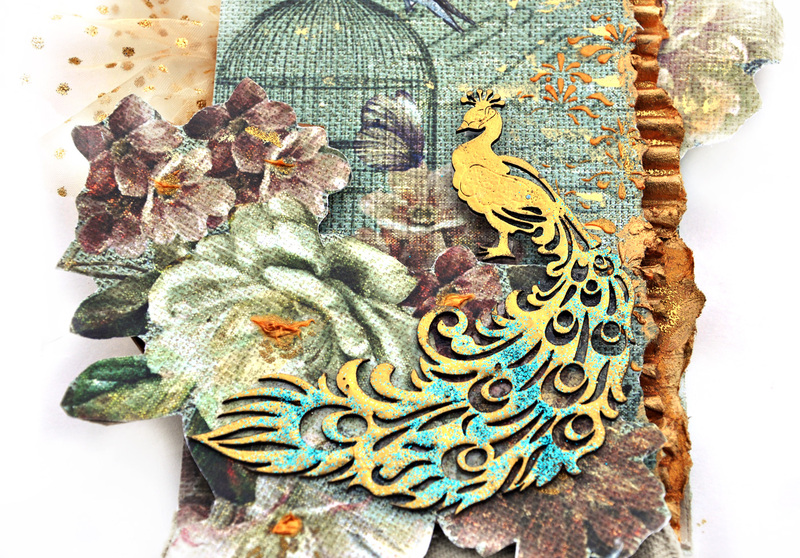 FabScraps French Heritage Chipboard Peacock DC63013 – paint with gold acrylic. 14. Coat with gold embossing powder and top with glitter before heat setting. Once you heat set, the glitter will stick. 15. Glue Peacock to the tag. 16. 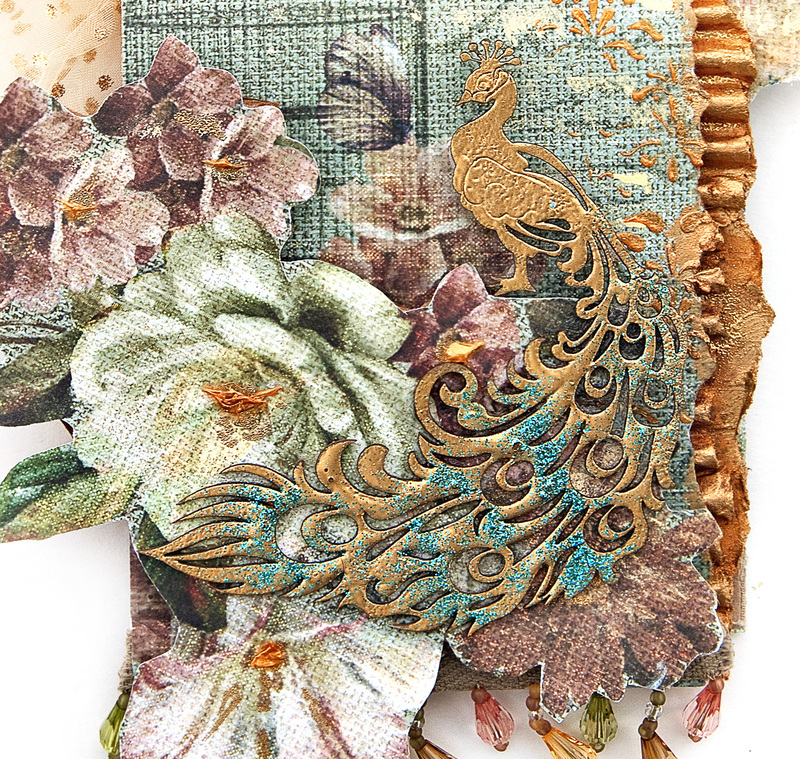 FabScraps French Heritage Chipboard Filigree Swirls – DC63008 – Paint gold, then sprinkle with gold embossing powder and heat set. 17. Glue to top of tag. .
19. Add a ribbon for hanging the tag.